CM Magazine:To Be My Father's Daughter. To Be My Father's Daughter. Carmelita McGrath. Research/writing by Sharon Halfyard. Marion Cheeks, ed. St. John's, NL: Educational Resource Development Co-operative, 2008. Coaker, W.F. (William Ford), Sir, 1871-1938-Fiction. Fisherman's Protective Union of Newfoundland-Fiction. My father was Sir William Coaker, founder of the Fisherman's protective Union, the greatest labour movement in Newfoundland history. Men make history; women like me, it seems, save it in scrapbooks. Portrayed through the eyes and memories of his daughter Camilla, Sir William Coaker, a well-known political figure in the history of Newfoundland and Labrador, is presented to readers as both as a visionary and a father. This work of historical fiction, interspersed with factual information and historical documents pertaining to William Coaker's leadership in the labour movement, is brought alive by the human element that resides in the work of Sharon Halfyard, Carmelita McGrath, and Marion Cheeks. This story is as much Camilla's as it is her father's story, thus making it appealing to a diverse group of readers. For those who want history, Sir William Coakers' story is recounted in clear, yet detailed text. For those who will connect with what it is like to be the only child and daughter of a famous man in the early 1900s, this is a story worth reading. It should interest both females and males with its content and visual displays. The graphic presentation of the book is remarkable. The cover, done in hues of ancient photographs, with the vibrant colour of the flowers, brings the past alive. The heavy glossy pages carry the weight of history. This illustrated book documentary of Sir William Coaker and his legacy will appeal to adult literacy learners, high school students, and anyone interested in Newfoundland history. However, the fact that this book is highly illustrated should not deter the serious history reader. Because the amount of text in this slim volume may not appeal to reluctant readers, it should not be perceived as an easy read. Instead, it will be challenging to many as it is so detailed throughout. The balance of fact and fiction is a fascinating way to depict history and the people who helped shaped that history. The timeline of historical events at the end of the book will answer any questions about the authenticity of the text while the acknowledgments give support to the imagination that is used in giving voice to Sir William Coaker and his daughter. Readers are given the opportunity to share in the life of Camilla as well as her father through photographs, newspaper clippings, letters, and other personal items. 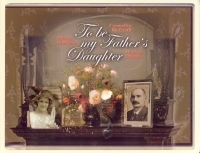 To Be My Father's Daughter is a book meant to be revisited rather than read in one sitting. It should provoke rich discussions about what it meant to live and prosper in this era, to be a female in the world of business and politics, and to be a father as well as a union and political leader. This book belongs in the classrooms of Newfoundland students. Beverly Fitzpatrick is a doctoral student at Memorial University in St. John's, NL.